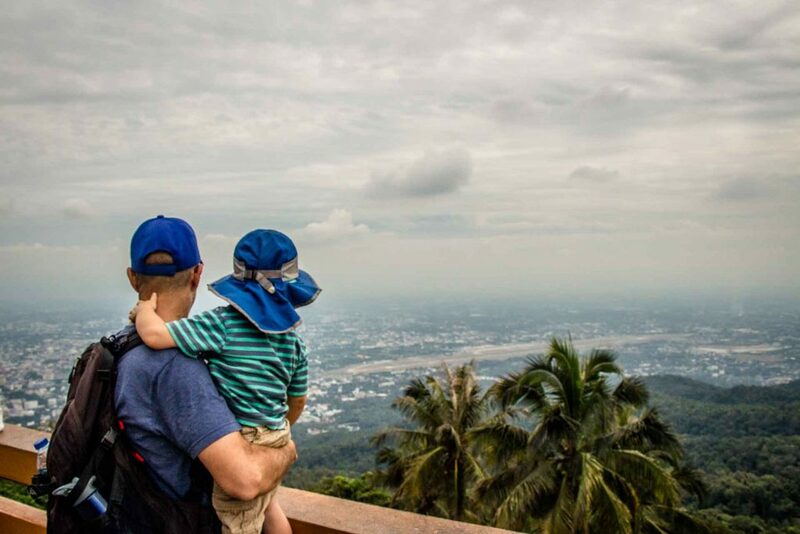 We had been to Chiang Mai once before without kids, a time when we could easily be backpacking in Thailand. Even having been to Chiang Mai before, it was one place that we felt we hadn’t really “seen it”. At that time, we had only a couple of days so our time was focused on a few Chiang Mai highlights which included a Thai cooking class (we highly recommend), a hike and a visit to Wat Phrathat Doi Suthep. 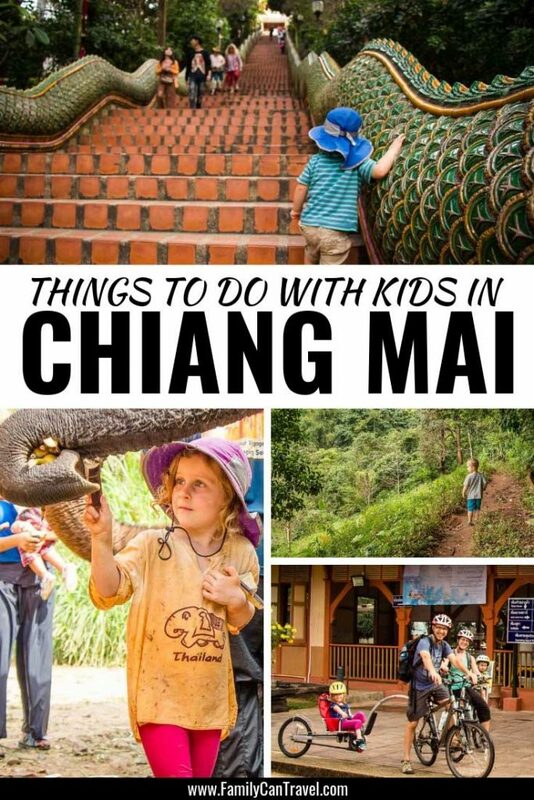 When we planned our Thailand itinerary with our children, we knew we wanted to experience Chiang Mai for families and easily put together list of top 5 things to do in Chiang Mai with kids. 3 Pin It For Later! Train from Bangkok to Chiang Mai: The overnight train is an excellent way to get to Chiang Mai. Not only is it fun and exciting for the kids, but you also avoid the cost of a hotel room for the night. Trips take about 13 hours and arrive in Chiang Mai between 7-9am. The night train to Chiang Mai is very popular, so advance ticket purchase is highly recommended. Bus from Bangkok to Chiang Mai: Overnight buses are another popular option for transport to Chiang Mai. Buses depart from Bangkok to Chiang Mai from Khao San Rd and the north bus station and the south bus station. The journey takes about 11 hours. As with the train, advance tickets are recommended for the overnight buses. Flying from Bangkok to Chiang Mai: If you don’t like the idea of overnight transportation, flying to Chiang Mai is a reasonably cheap alternative. Flights from Bangkok to Chiang Mai take around 90 minutes. Click here to see your flight options. 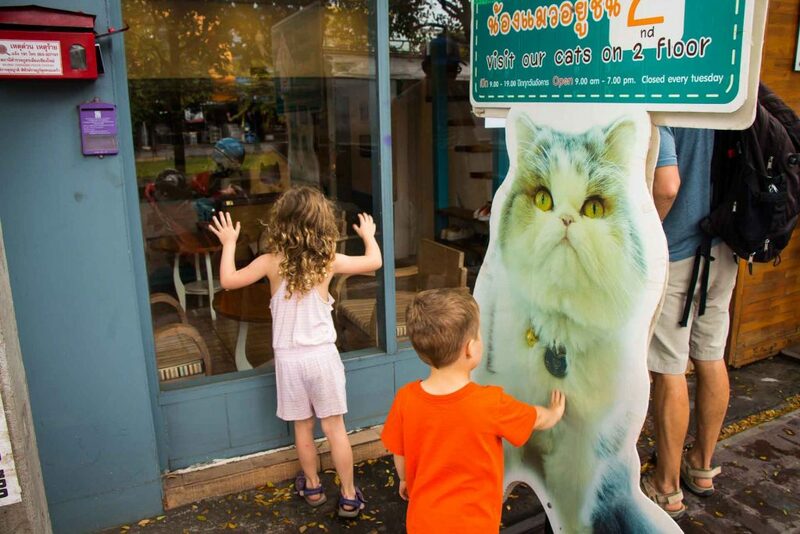 Don’t miss these 39 things to do in Bangkok with kids! 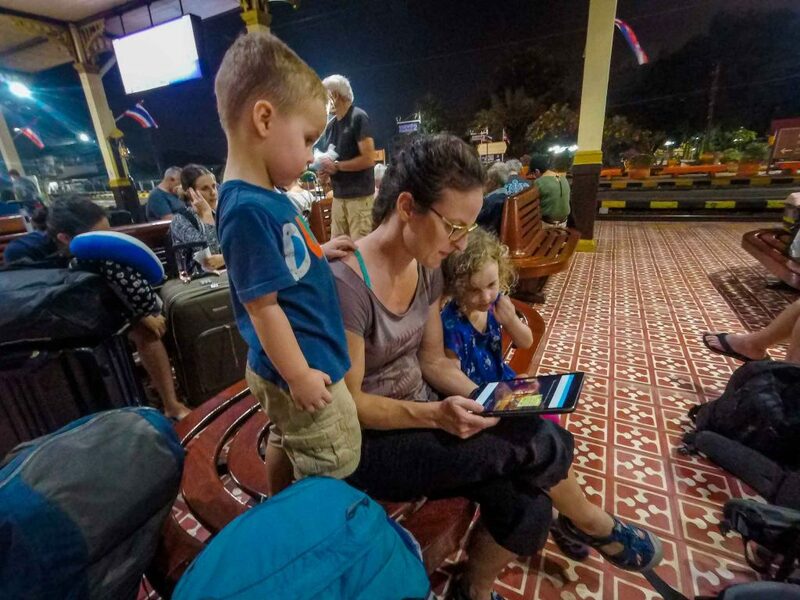 How we got from Ayutthaya to Chiang Mai with kids: We traveled to Chiang Mai from Ayutthaya, which just happens to be on the Bangkok to Chiang Mai train line. We took the #9 overnight train which arrived in Chiang Mai just after 7am. 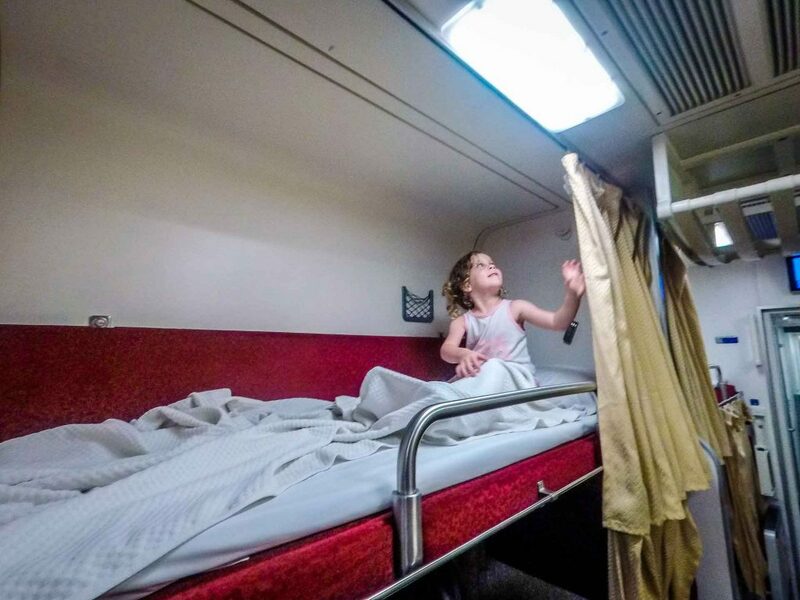 The kids loved the overnight train and to our surprise actually got a decent, but short sleep. Advance tickets are highly recommended. Let’s get this out of the way first…we didn’t really like the city of Chiang Mai. We found Chiang Mai to be busy, crowded and honestly, not that interesting. But, its saving grace is that there are a lot of amazing adventurous things to do in Chiang Mai. Our night train from Ayutthaya pulled into the Chiang Mai train station around 7:30am. Despite sleeping well on the train, the schedule of the train meant the kids got about 3 hours less sleep than normal and it showed throughout the day. They were pretty bad – moody, complaining, not listening, etc. The night train to Chiang Mai was still worth it for the convenience and experience, but we paid for it on our first day there. Despite our temple overload in Ayutthaya, we decided to see the main temples in Old Town Chiang Mai as it was a simple outing that was close to home. Given the kids’ sleep deficit from the train, we didn’t want to push them too hard, so after getting settled into our Airbnb, we took a Grab Taxi (Thailand’s equivalent to Uber) to Wat Phra Singh. We visited Wat Phra Singh and Wat Phan Tao during our walk through Old Town. Both sites were very impressive and are worth a visit, but we didn’t tour them extensively. After 7 days without a washing machine, we were so excited to have one at our Airbnb that we immediately did a load of all our sweaty clothes from our activities in Kanchanaburi & Ayutthaya. As a result we weren’t dressed properly for visiting the temples in Chiang Mai. We wanted to visit Wat Chedi Luang, but they didn’t have any courtesy sarongs for us to wear and we didn’t want to offend anyone. Afterwards, we let the kids play with their toys at the condo and in the pool for a good chunk of the afternoon. The kids don’t love Thai food and we felt they hadn’t been properly stuffed in a while, so we treated them to some delivered Pizza Hut. I think this did us all some good – the kids got full tummies of a familiar food they love, while we didn’t have to deal with them at a restaurant trying to get them to eat something. Seeing elephants in Chiang Mai was one of our top priorities for our family. We spent a lot of time looking for the best place to see elephants in Chiang Mai and landed on Elephant Nature Park. We had an amazing day at this “saddle off” elephant camp an hour north of Chiang Mai. 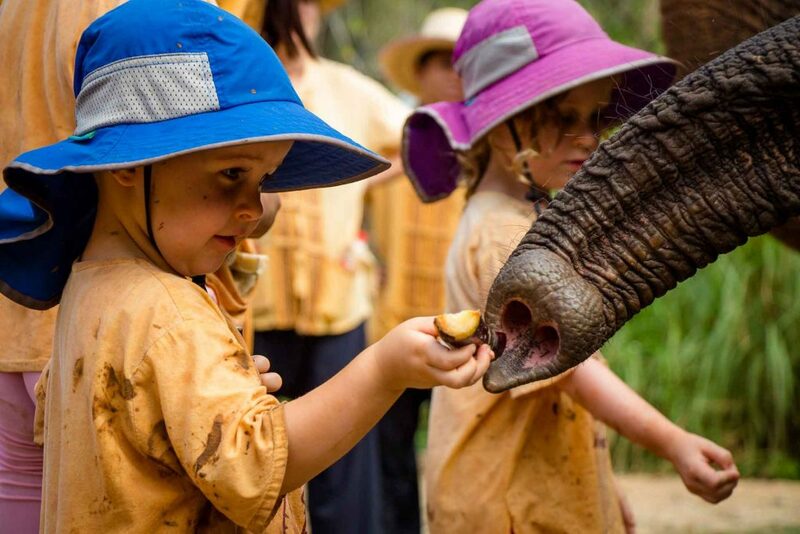 The kids loved feeding the elephants, walking with them and playing in the mud with them. 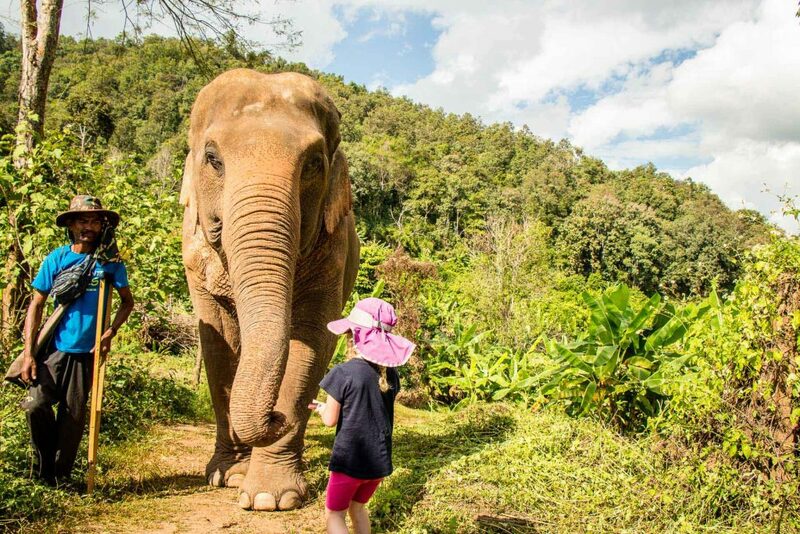 Read a full account of our experience at Elephant Nature Park with Kids. 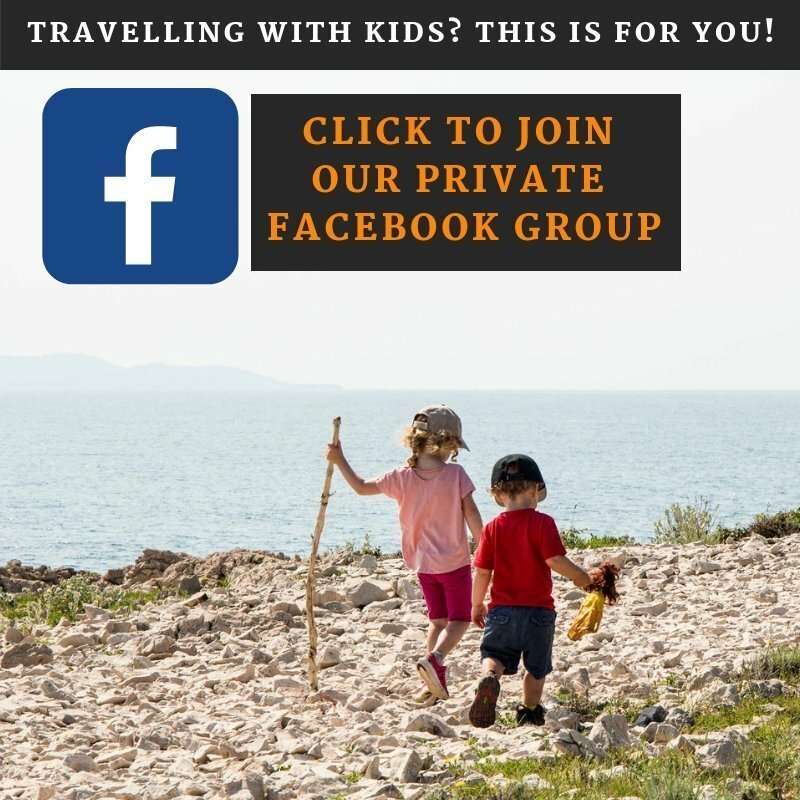 Craving some beach time in Thailand with kids? Check out our list of our favorite southern Thailand beaches. 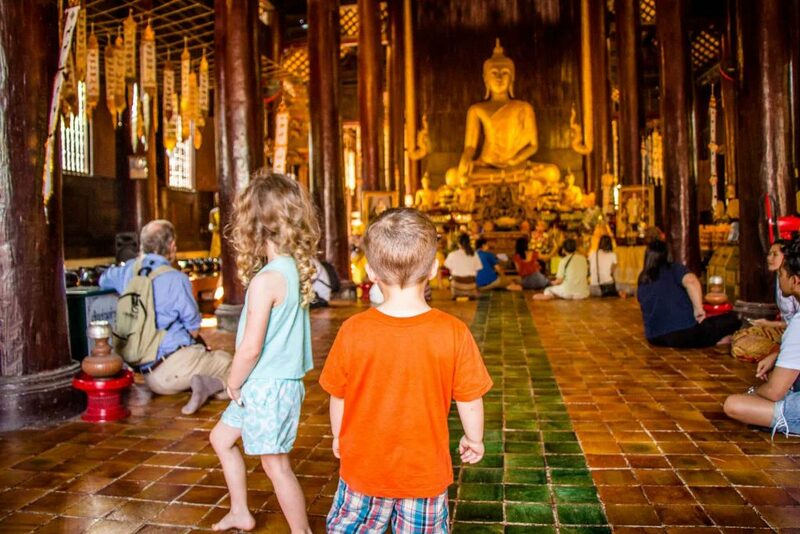 For more Thailand travel ideas, see our posts on our visits to Kanchanaburi, temple hopping in Ayutthaya with kids and Ao Nang beach holiday with kids. 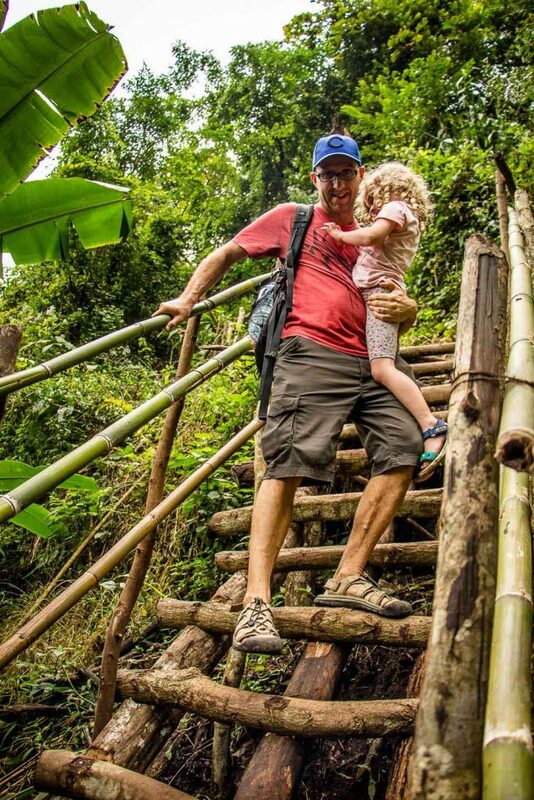 We can never go too long without a family hike, so when we heard you could hike to Wat Phrathat Doi Suthep, we were in! The Monk’s Hike is a moderate uphill hike to Wat Phrathat Doi Suthep with a stop halfway up at the smaller, but very atmospheric Wat Pha Lat. The trailhead is on the western edge of Chiang Mai. Be sure to take a picture of the trail map at the trailhead as the path up can be a little confusing at times. 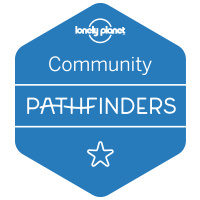 The trail is marked by small golden strips of monk’s robes tied to trees along the way, although most of them are pretty worn and are sometimes hard to spot. The trail winds up the side of the mountain through a dense forest. The trees offer a decent amount of protection against the sun, but it’s not complete coverage, so apply sunscreen ahead of time and bring it along as you’ll get sweaty on the way up. We did this hike during the December dry season, so the dirt trail was nice and dry. Another nice element of this hike is that it runs parallel to a stream for a good portion of the distance. You can see it sometimes, but mostly you just hear it. The downside of this stream is that there are a few mosquitoes around, so make sure you also bring bug repellant. Also, make sure you look down before you stop to rest as there are lots of ant trails running across the path. The trail is a moderate incline to the first temple, Wat Pha Lat. It’s a hard enough hike to break a sweat, but anyone in reasonable shape can do it. Wat Pha Lat is an atmospheric jungle temple resting alongside the aforementioned stream. The atmosphere was a little tainted during our visit due to a large catered meditation event that was just finishing up, so there were large areas with tables of food being cleared during our visit. Not exactly a zen moment for us, but we were able to look past it and enjoy the beauty of this stream-side, jungle temple. To get to the trailhead for the second leg up to Wat Phrathat Doi Suthep, you need to walk up the access road, to Sriwichai Alley (road 1004). Here, you turn left and walk for a few minutes until you see the trailhead on the right. The second leg of the Monk’s Trail is approximately the same distance as the first, but it is noticeably steeper. The dirt hiking trail has steps carved into it for a decent amount of the distance. The trail also has a lot more tree roots to deal with than the first half, so you’ll need good shoes for this leg. We wear Keens sports sandals as they are a good compromise for the hot Thailand climate and the rigors of mountain hiking. It took us approximately 1 hour to reach Wat Pha Lat, 10 minutes to walk to the second trailhead, an hour to hike the second leg of the trail, 10 minutes to walk to the base of the temple and another 10 minutes to climb the stairs to the very top, for a total hiking time of 2h30m. Our kids walked nearly the whole way from the base to the very top themselves. We carried them on the busy road between trails and then again for small distances as we neared the end of the second part of the hike. 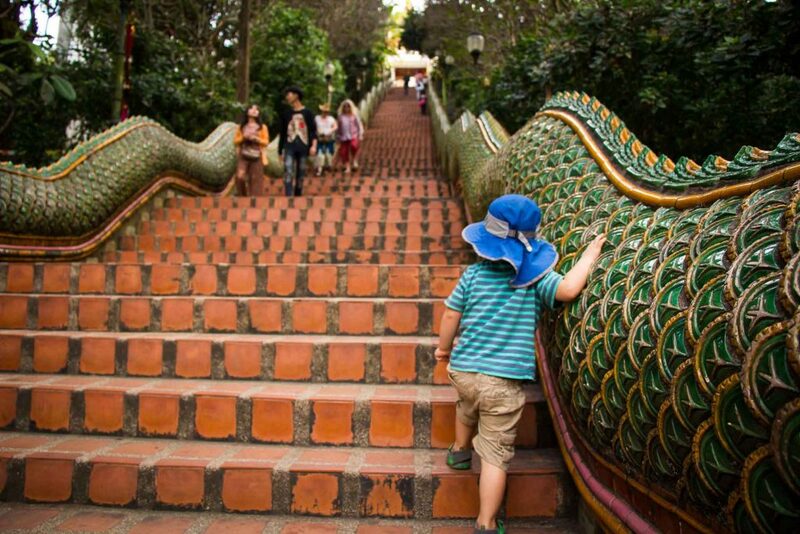 Wat Phrathat Doi Suthep is one of the top temples to see in Chiang Mai. It’s a beautiful temple in a beautiful setting with amazing views and is therefore extremely popular. If you hike to the top, you’ll feel so good about your family’s efforts as you look at the 99% of the people who paid to get a drive to the top. The views of Chiang Mai below are excellent and the temple itself is amazing. There are many stands selling drinks and snacks to reward your family for a job well done. At this point we were nearing the halfway mark of our month in Thailand and the kids were starting to go a little crazy, so we decided to give them a break from our usual travel routine and give them a day of fun stuff just for them. We really enjoy doing is exploring a city on foot, so rather than hop into a tuk tuk to get to our next destination, we decided to walk. The walk was enjoyable and interesting, but it did take 3x longer than the 30 minutes that Google Maps had estimated. Chalk the delay up to kids who didn’t share our enthusiasm for walking, even though we were heading to a playground. 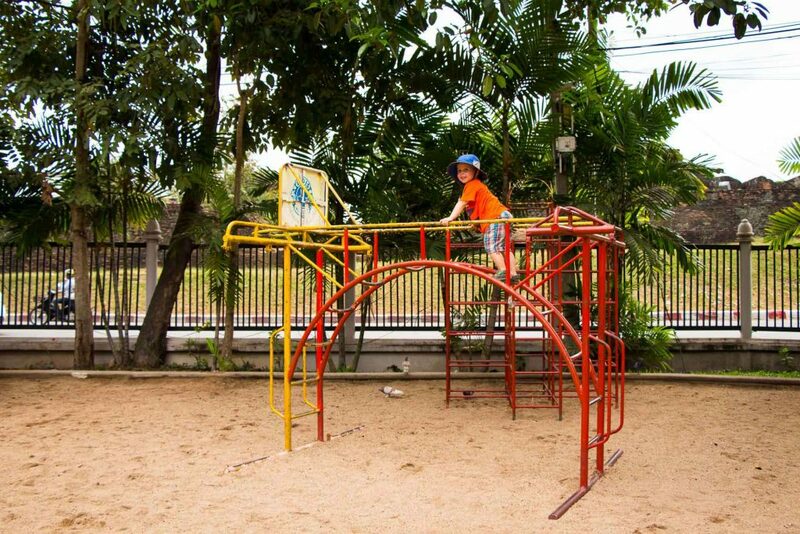 We eventually arrived at the Chiang Mai playground in the Nong Buak Hard Public Park, which is nestled in the extreme SE corner of the Old Town. This park is very nice with many ponds, sculptured shrubs, jogging paths and more. The playground is quite large and well-kept by international standards. There’s nothing like some “run around and be crazy” time at a playground to make a kid feel normal again. Our daughter made a new friend in no time and was off playing games. We decided to give the cat thing one more try and took a Grab to the Cat Café near our Airbnb. We decided that perhaps it was best if our three year old got some ice cream as a treat while our 5 year old got time to play with the cats. It was a good decision. 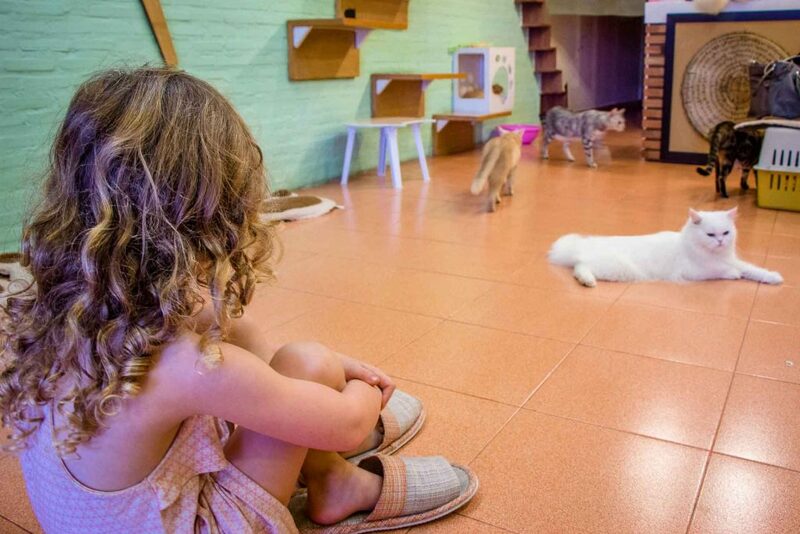 Our daughter had fun with the cats, although most of the felines were quite antisocial. That didn’t seem to matter to our daughter who found enough social cats to play with to keep her happy. We ended the day with a quick dip in the pool at our Airbnb. We always find a day just for the kids is a good investment for our travel adventures to come. Taking a bike ride through the country-side is one of our favorite things to do while traveling. 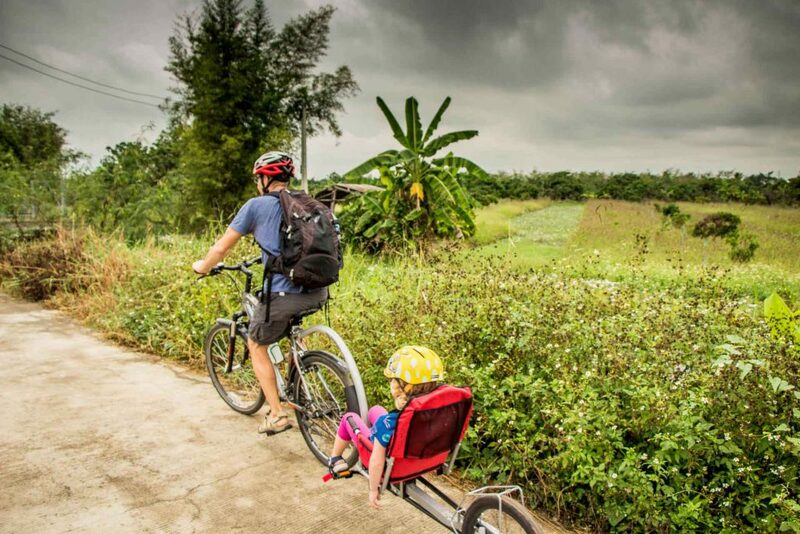 It’s rare to find a tour operator with good equipment for small kids, so we were very excited to find Grasshopper Adventures as they offer family-friendly bike tours with quality equipment. We signed up for the Chiang Mai by Countryside tour. Our 35 mile (57km) journey began by taking our bikes on a train for a 30-minute journey south to Lamphun. We spent the rest of the day enjoying our ride back to Chiang Mai, visiting temples and trying local food. 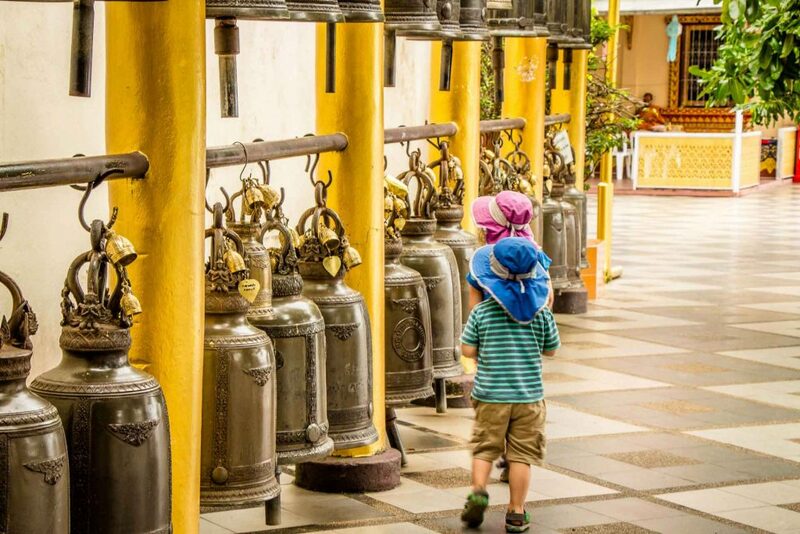 This was one of our favorite activities in Chiang Mai with kids. 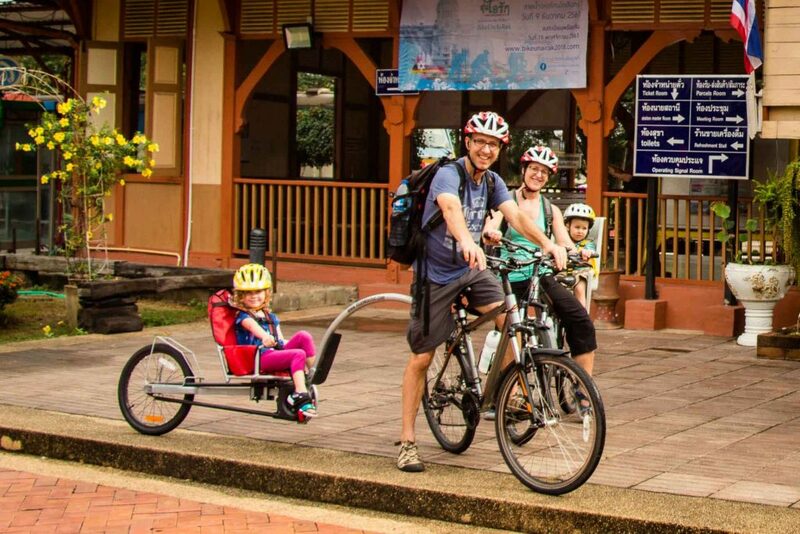 Read our full account of our Chiang Mai bike tour with kids. Visiting Doi Inthanon National Park is definitely one of the best things to do around Chiang Mai. We planned a full day for our visit and hired a private driver to take us to Doi Inthanon National Park. After a 90 minute drive from Chiang Mai, we made our first stop within Doi Inthanon at the Wachirathan Waterfall. Emerging from the car, we immediately noticed that the higher altitude makes the air much cooler than it was in Chiang Mai. 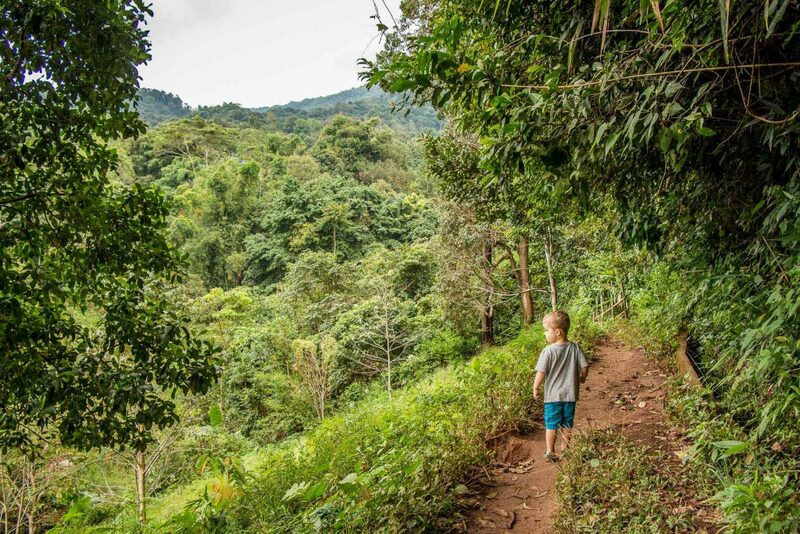 The walk from the parking lot to the waterfalls is very short and paved, so anyone can do it, including small children. 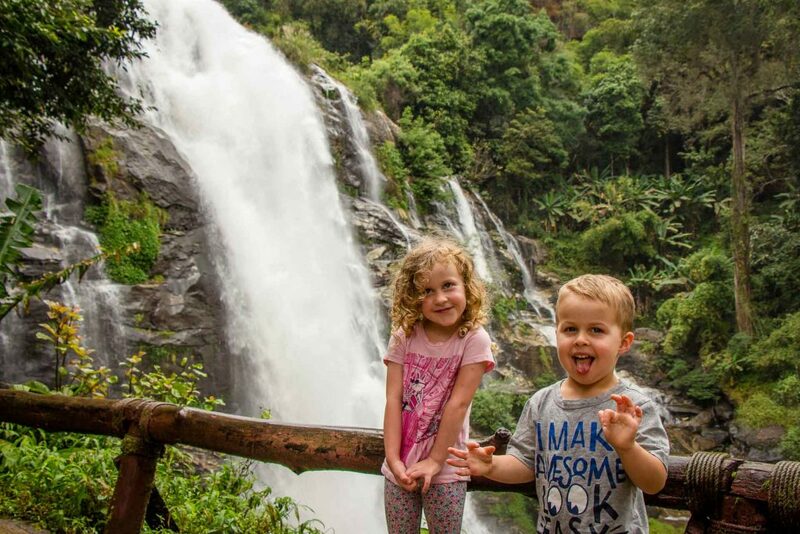 Despite being at the beginning of the dry season in Chiang Mai, the flow of the 260 foot (80m) high waterfall was quite powerful, enough to kick up a lot of spray to the main viewing area. There are a few pathways leading up and down from the main viewing area allowing for different viewing angles of the waterfall. Given this impressive waterfall is only a few minutes off the main national park road, it’s worth a stop for a quick look. Next we drove all the way to the summit. At 8,415 feet above sea level, this is the highest point in all of Thailand. When we got out of the car it was only 54F (12C)! That’s a huge change from the 85F+ (29C+) it’s been we’ve had in Thailand so far! Given you can drive literally the entire way up to the summit, it was very busy. As Canadians, we were still quite comfortable in our shorts and t-shirts, so we admit to having a few laughs at the people in down jackets. To be fair though, for many of the locals 54F will be the coldest temperature they’ll ever experience! To be honest, the summit experience wasn’t as good as we had hoped for. Doi Inthanon has a reputation for being cloudy at the top, but we were lucky enough to have blue sky. Despite having no clouds, there weren’t any real scenic views to enjoy. There is a wooden walkway which winds its way through a very lush, moss lined cloud forest which we enjoyed. There are also several photo ops with the altitude signs, but that was really about it. Surprisingly, there were no vistas to enjoy of the surrounding lands below. It took a long time to drive to the summit and we didn’t feel it was worth the time. Our next stop was the pagodas, which were built to honor the 60th birthdays of the King and Queen in 1987 and 1992 respectively. 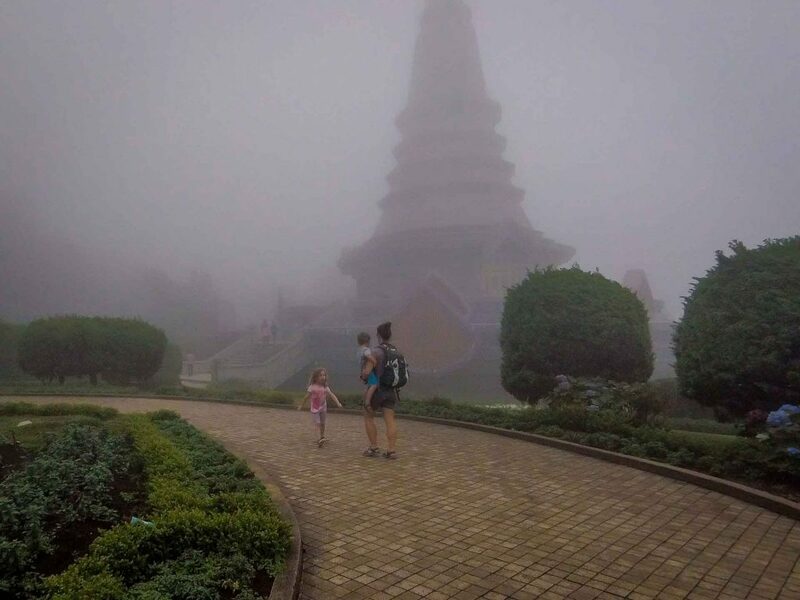 By the time we had descended to the level of the pagodas we had reentered the clouds; from the parking lot we could kind of make out the shapes of the two pagodas through the thick cloud that wrapped around them. Despite the cloud, we were able to walk up the stairs to each pagoda and once we were close enough we could admire their size, beautiful shapes and carvings. Still, without the ability to see well and enjoy the setting, we didn’t linger here for long. We stopped at the cluster of touristy restaurants near the Visitor’s Center for lunch. As we were walking towards the restaurants, we noticed a lonely little local’s restaurant across the highway. We asked our guide about it and he said he loves the food there, so we all happily walked across the highway and had an incredibly good lunch for a fraction of the prices across the street. He recommended the Pad See Ew, a stir fry noodle dish with pork; we had never heard of it before and we absolutely loved it! The kids were also quite happy with their Thai omelet with pork. The real reason we came to Doi Inthanon was to do some hiking. We had read about the Kew Mae Pan nature trail online and thought it sounded pretty good, but our guide talked us out of it. He said it was overrun with tourists, and looking at the overflowing parking lot as we drove by, he was right. He suggested we try the Ban Mae Klang Luang Nature Trail instead and we’re very glad we did. We pulled into the near empty parking lot, not far below the Visitor’s Center. Our driver left us in the hands of a mandatory local guide (200 baht per group; roughly $6USD) and said he’d meet us at the village at the far end of the hike. Our local guide didn’t speak much English, so we didn’t learn much from him, but he was excellent with the kids; helping them climb down rocks, making sure they didn’t get too close to perils, etc. This hike was very beautiful and aside from two other groups, we didn’t see any other tourists. The hiking trail follows a river downhill though a thick, lush forest for 2 miles (3km) until you reach the village where the guides live. The forest is full of treasures with several impressive waterfalls, flowers, butterflies, vines, exotic mushrooms, etc. The trail also passes a strawberry farm and a coffee bean plantation. There are shops in the village which roast the Arabica beans and let you have a cup of their own beans. Given some recent rains, the trail was muddy and a little slippery in spots. 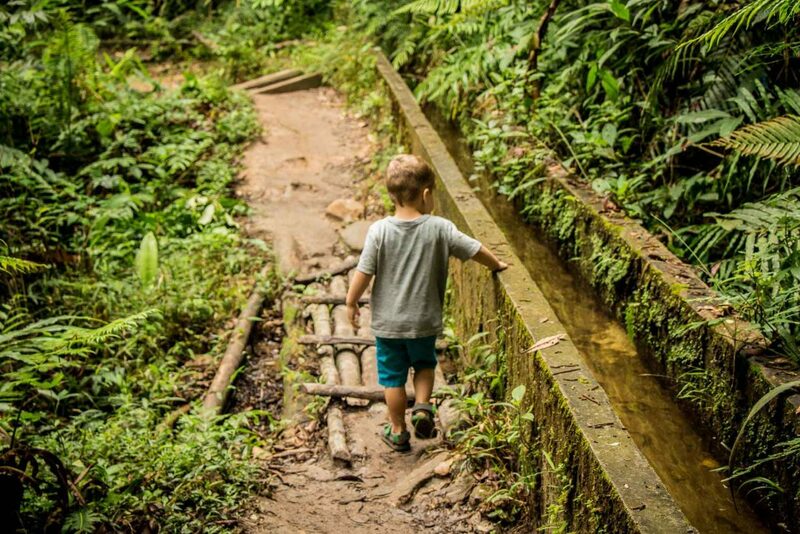 There were a few sections which were too hard for our small kids; there were several downhill staircases and bridges made of bamboo which we felt were too dangerous for them to do on their own. 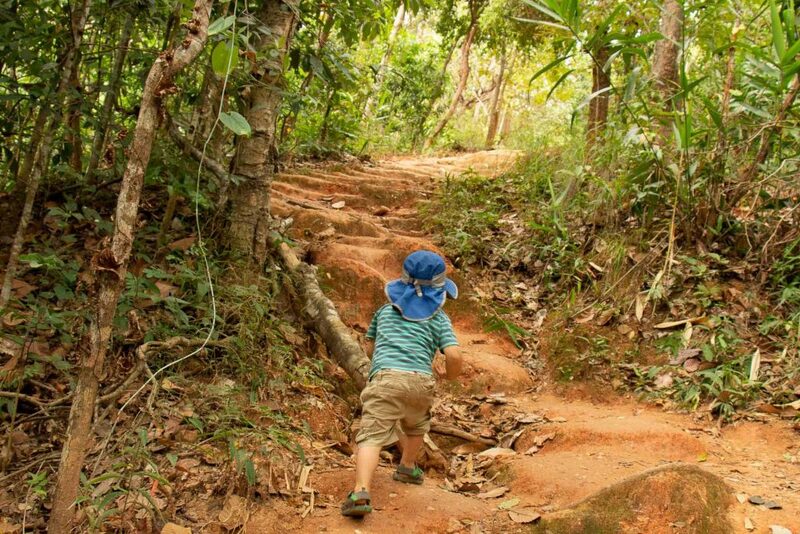 If it weren’t for these manmade challenges, our kids could have hiked the whole way themselves, but given we had to carry them a lot, we wish we had brought our carriers. 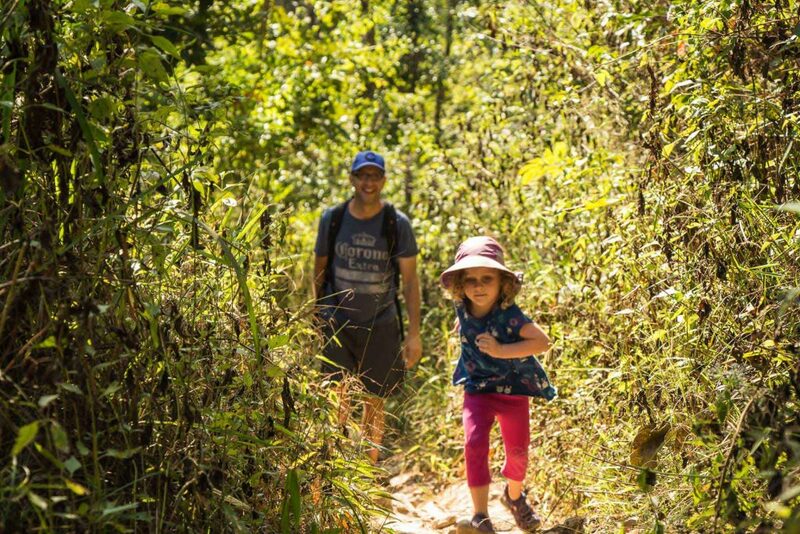 We’re very glad we did the Ban Mae Kiang Luang Nature Trail instead of Kew Mae Pan. It was a fun, family outing in raw Thailand nature, just the way we like it. 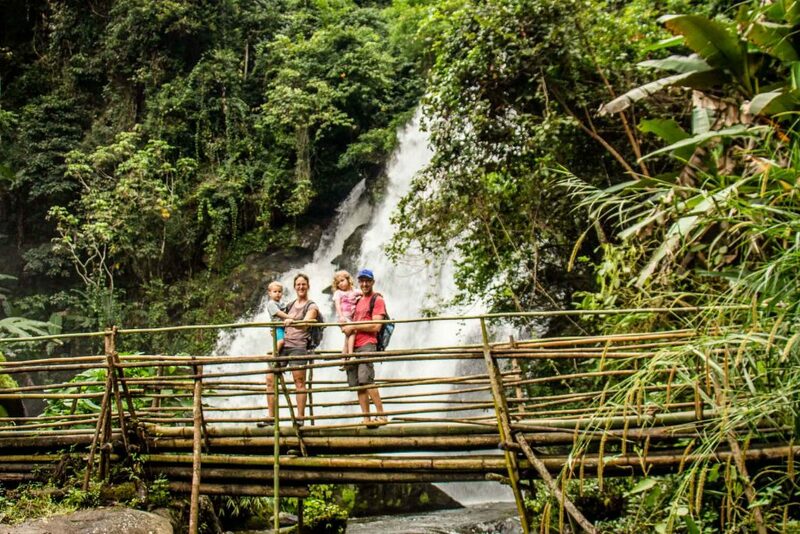 This highly rated private day trip from Chiang Mai to Doi Inthanon is a near identical match to what we did during our visit to the national park. 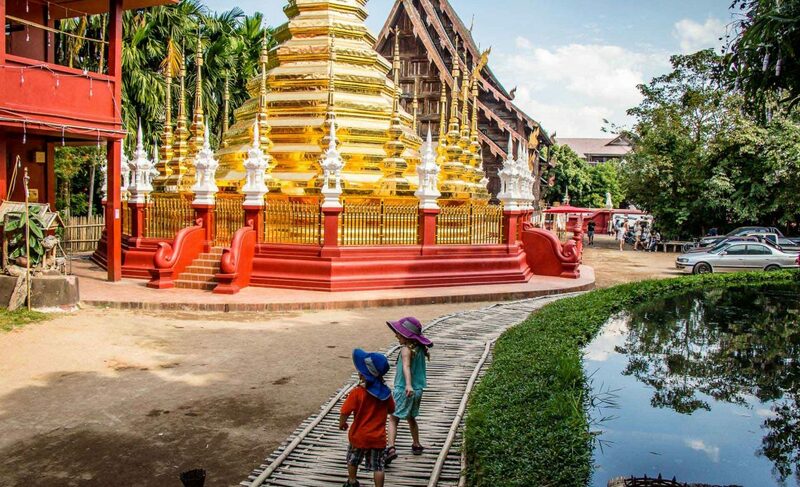 That’s our 6 day itinerary for Chiang Mai with kids! 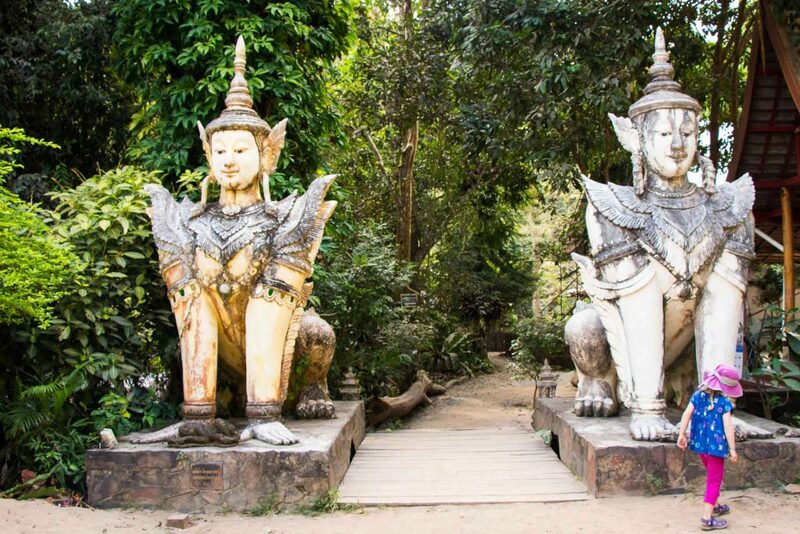 Despite not loving the urban side of Chiang Mai, the surrounding natural wonders made up for it. 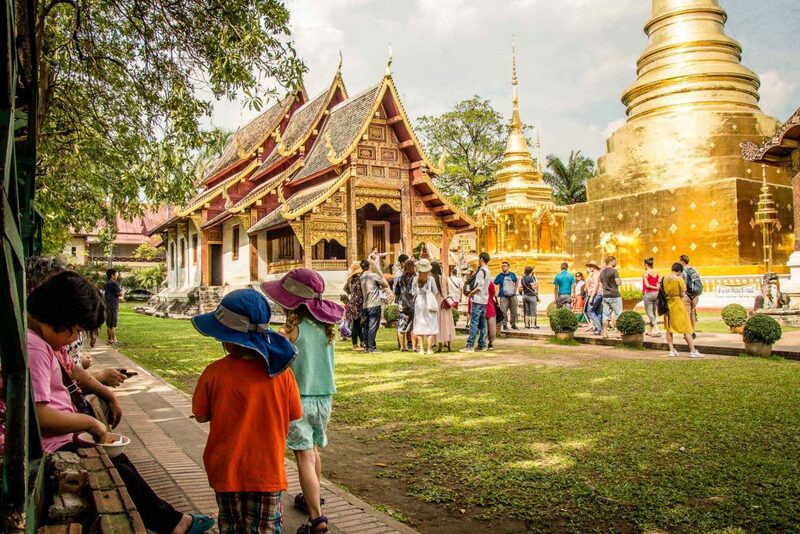 As an active family who loves to spend time in nature, we found a lot of excellent activities to do in Chiang Mai. 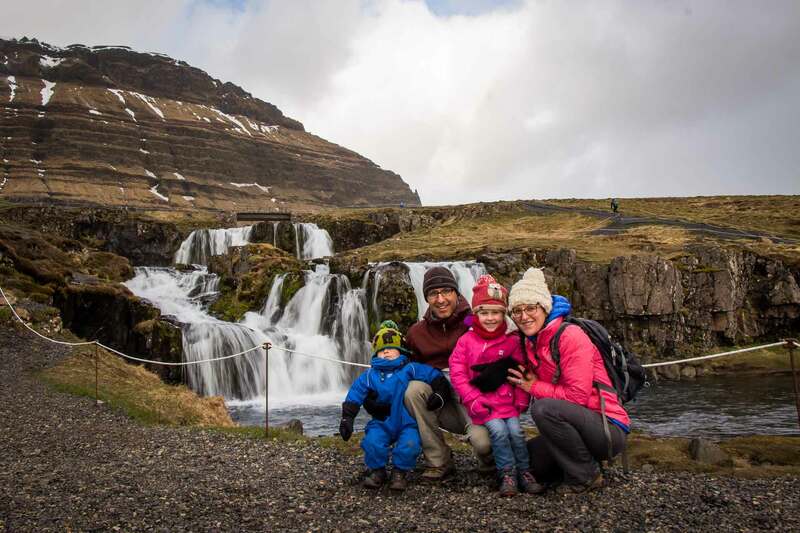 We only write about destinations we have personally visited with our family. This post contains compensated links. We are grateful to Grasshopper Adventures for their generosity.